Pet ownership adversely impacts the environment in a variety of ways, including effects on local bird populations, carbon emissions, and other problems. There is evidence that cats’ impact on birds has been overestimated. Studies of domestic cats have found that only 49%-56% hunt at all, and few of those that do are regular hunters (Perry, 1999). A study of domestic hunting cats in Australia found that the majority went after rodents and rabbits, just 19% hunted introduced species such as sparrows and starlings, and only 7% caught native birds (Millwood & Heaton, 1994). There is also evidence that cats may play a role in controlling other introduced species in ecologically sensitive areas. For example, a recent attempt to protect Australian seabirds by removing cats led to an explosion in the rabbit population, and the rabbits decimated vegetation on which the birds depended for cover (“Removing Cats to Protect Birds Backfires on Island,” 2009). Plenty of bird lovers would argue that even if the number of birds killed by cats has been exaggerated, there are still far too many, and so domestic cats should be kept indoors. Many cat lovers would agree, given that outdoor cats suffer more injuries and illnesses, and die younger on average. Although feline disruption of wildlife has received a lot of press in recent years, recent studies suggest that the impact of dogs has been underestimated. Dogs have been implicated in the rare European Nightjar’s decline (Langston et al., 2007), and a recent study found that in areas where dogs are walked, the diversity of birds is reduced by 35% and their abundance by 41% (Banks & Bryant, 2007). A medium-sized dog requires 0.84 hectares of land to produce its food each year – a bigger ecological footprint than running two SUVs. Even a Chihuahua has an annual footprint of 0.28 hectares, compared to just 0.15 for the average cat (Douglas, 2009). Overall, feeding an average dog generates 596 lbs of CO2 emissions annually, compared to around 517 lbs for a cat. To make matters worse, if an owner drives 10 miles to an off-leash dog park just once a week, she’ll generate an additional 400 lbs of CO2 each year (Whitford, 2008). According to a 2007-2008 American Pet Products Association survey, dog owners spend an average of $127 per year on groomers or grooming aids, $66 on treats, and $41 on toys, whereas cat owners spend $18 on groomers/grooming aids, $40 on treats, and $26 on toys. Products are usually imported, made of plastic, and surrounded by layers of packaging. Negative environmental impacts accrue through production and transportation of imported pet products, as well as disposal of products and packaging in landfills. According to the U.S. Department of Agriculture, the average dog will generate about 274 pounds of waste per year. Given that there are approximately 77.5 million owned dogs in the U.S. (Humane Society, 2009), this amounts to an enormous volume, and if this waste is left lying around outdoors, it increases the risk that bacteria and viruses will be washed into local waterways. Cat waste is also a problem. Mining operations used to produce clay kitty litter pellets have adverse environmental impacts (Klaiman, 2008), and in the United States alone, more than 3.4 million tons of kitty litter ends up in landfills every year (Whitford, 2008). Keep cats indoors (cat experts say that indoor cats can be happy if provided with an enriched environment), or build or purchase outdoor cat enclosures for safe excursions. 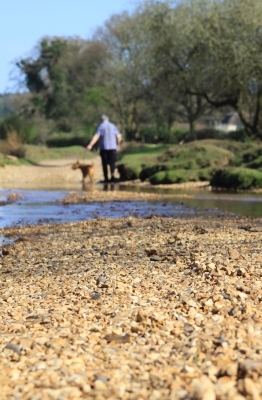 Don’t walk dogs in ecologically sensitive areas, particularly those with ground-nesting birds. Seek products made from environmentally friendly materials and less packaging when purchasing food bowls, carriers, toys, and other pet products. Have pets spayed and neutered to prevent overpopulation. Use natural, non-toxic flea control methods. As for disposing of pet waste, there are no easy answers. Even biodegradable cat litters and bags will take a long time to break down in landfill conditions because there is not sufficient oxygen exposure. Some people advocate flushing pet waste, but this uses a lot of water and concerns have been expressed about the potential spread of zoonotic diseases. Others recommend using biodegradable cat litter and composting pet waste, which is probably the most environmentally friendly solution. Banks, P., & Bryant, J. (2007). “Four-Legged Friend or Foe? Dog Walking Displaces Native Birds.” Biology Letters, 3: 611-613. Klaiman, M. (2008). “Litter and the Environment.” NYDogsWorld.com. Langston et al. (2007). “What Effects Do Walkers and Dogs Have on the Distribution and Productivity of Breeding European Nightjar Caprimulgus Europaeus?” Ibis, 149: 27-36. Millwood, J., & Heaton, T. (1994). “The Metropolitan Domestic Cat.” Urban Animal Management, UAM.net.au. Perry, G. (1999). “Cats – Perceptions and Misconceptions: Two Recent Studies About Cats and How People See Them.” Urban Animal Management, UAM.net.au. United States Department of Agriculture. (2005). “Composting Dog Waste.” www.ak.nrcs.usda.gov. USA Today. (13 January 2009). “Removing Cats to Protect Birds Backfires on Island.” USAToday.com. Whitford, B. (2008). “Cats vs. Dogs: Which Pet Is Greener?” Mother Jones. MotherJones.com.